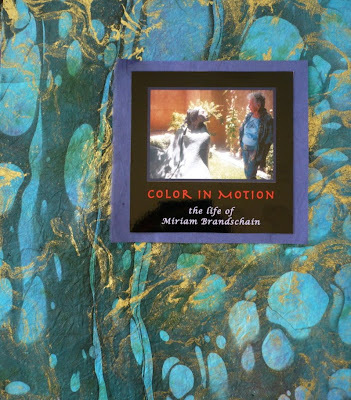 Not long ago, I had the special honor of meeting and getting to know the artist Miriam Brandschain. Miriam is a fine example of a woman who has lived an incredibly active creative life and who, at 96 years old, continues to inspire. Her humor, quick wit and sharp powers of observation make her a lively conversationalist and she still finds delight in music, dance and art. Over four days of intensive interviews, she shared her life, her loves, her achievements and her disappointments. What I found fascinating was that even though Miriam grew up during the Depression, she never for a moment lost her sense of abundance. Her dazzling blue eyes lit up as she described her childhood: playing ‘Red Rover’ in the streets of Philadelphia; walking to the cinema to see serials with her sisters; tasting hand-cranked ice cream mixed with crisp pretzels and discovering her love of color – a fascination that would lead to a life-long love affair with art. As a young woman, Miriam studied drawing, painting and sculpture with such legendary artists as impressionist Roy Nuse (www.tfaoi.com/aa/3aa/3aa176.htm) and Morris Blackburn (www.dolanmaxwell.com/artists/blackburn), among others. She exhibited her own work at the Philadelphia Artists Guild and was a respected art educator for many years. Miriam was not only an artist -- she was a highly successful businesswoman during a time when few females worked outside the home. For over a decade Miriam was co-owner of the Fishman-Weiner Gallery in Philadelphia, where she helped promote innovative artists and expand awareness of international art. During this time, she also raised two daughters, both highly creative individuals in their own right, and was involved in philanthropic work in her community. I was sad to see our interview come to an end, but then began the very challenging task of distilling 96 years of life into a 25 page book. Soon, the text for the book was completed, the photos chosen and the Italian papers ordered to hand bind the manuscripts into ten artisan books. By then, I felt that I had been blessed not only by a beautiful new friend, but by someone who was truly an angel. Seeing her story come to life was a magical moment! Aside from being absolutely charming, there is quality in Miriam that seems to radiate from most creative people I know – that is, she is filled with joy in being able to share her work with others and to kindle others’ imaginations. This is how our stories continue and how we evolve, with the light being passed, one to one to one. Thank you, Miriam, for carrying that spark and for being such a special inspiration to us all! What a wonderful story, how I wish I could see, feel, take in the book in all its glory!